Thank you for the opportunity to give feedback on what is the best salon I have ever experienced. The staff are wonderfully friendly and welcoming. The way the salon is set up makes the whole experience feel relaxed and comfortable. Rhiannon is a fabulous stylist who knows exactly what I want delivering beautiful results every time. 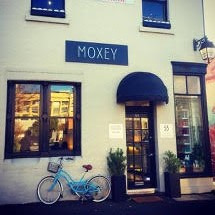 Of all the salons I have gone to in the last 25 years Colin Moxey is the only one I keep going back to. Very friendly, contemporary salon. Professional, expert staff, would highly recommend! I have had my hair and colour done at this salon since it opened (and by salon staff when they were at their previous salon). They are very friendly, and I found their prices quite reasonable, particularly given the location. The salon has a lovely feel to it in an old (renovated) building off Chapel Street. Good massage chairs when having your hair washed, good coffee, good magazines! Easy parking at the Prahran Market car park, which is not very expensive. Richard did my cut, and he is meticulous about it. Colin often did my colour. I also appreciate (particularly now, having moved interstate and having to find a new salon), that they do not try to shove every product down your throat, like a lot of salons do. Highly recommended.